There are a lot of wonderful cool weather squash varieties from the most commonly known like butternut and acorn to lesser know ones like kabocha. Among the lesser known, but incredibly delicious and versatile, is the delicata squash. It’s often called the “sweet potato squash” for its mild, brown sugar flavor. It’s a good source of beta-carotene and vitamin C.
It’s compact size and thin, edible skin means it is the perfect vessel for stuffing. To balance the sweet, creamy texture of the squash, I try to add a little spiciness to the filling. 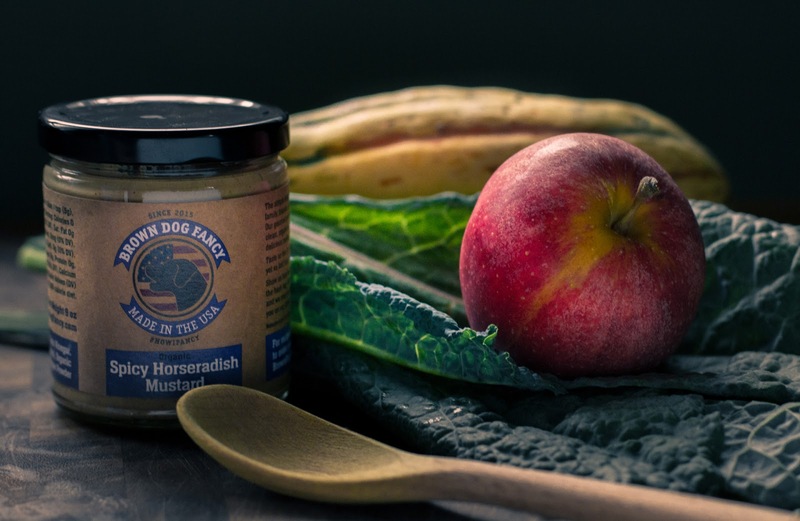 In this case, I used Connecticut made Brown Dog Fancy spicy horseradish mustard, but any spicy mustard will do. Packed with protein-rich quinoa, fresh apples, and kale this vegetarian recipe makes for a very hearty fall meal. Slice off the ends. Split the delicata squashes in half lengthwise. Scoop out and discard the seeds and membrane. On a large rimmed baking sheet lined with foil, place the squash halves face down and roast in the oven for 20 minutes. While the squash roasts, pour the vegetable broth into a medium-sized saucepan and bring to a boil on the stove over medium-high heat. Once the broth is boiling, stir in the quinoa. Cover and reduce heat to low. Simmer 10 minutes until all the liquid has been absorbed. Place the cooked quinoa into a large bowl and set aside. In a large sauté pan heat 1 tablespoon of coconut oil. Sauté the onion until translucent. Add in the chopped apple and cook, occasionally stirring around the pan, until soft. Add the shredded kale and sauté until just wilted. Season with salt and pepper to taste. Remove from heat and mix the vegetable mixture into the quinoa. Stir in the mustard and chopped pecans. When the squash is done roasting, remove from oven. Drop oven temperature down to 350 degrees Fahrenheit. Stuff each squash half with the quinoa and vegetable mixture. 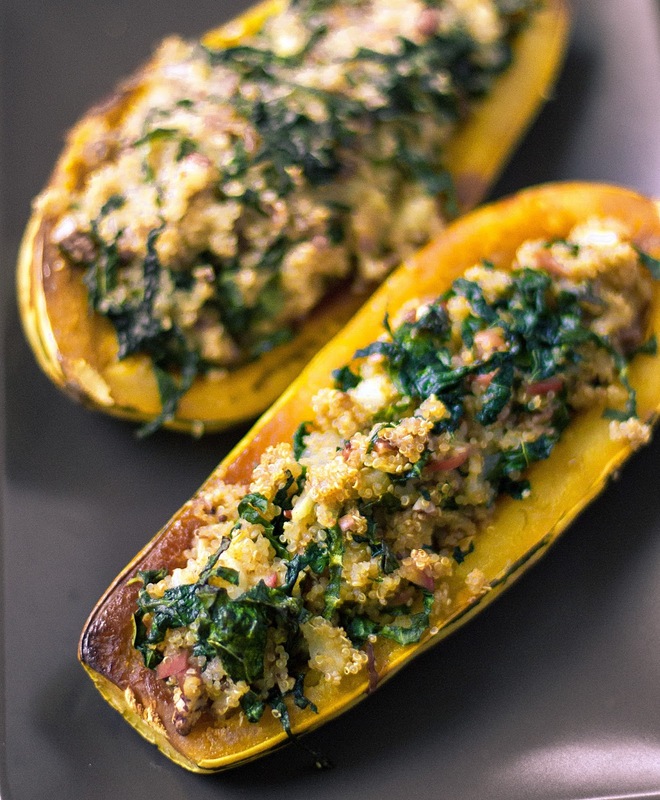 Place stuffed squash halves back onto the baking sheet. Drizzle 1 tablespoon of coconut oil over the top and place back into the oven. Roast for an additional 10-12 minutes. 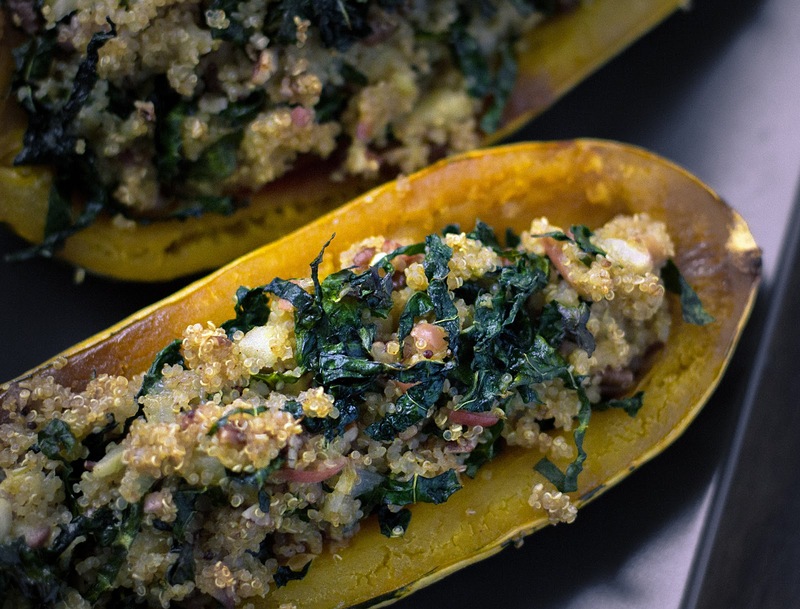 This looks like a great fall version of stuffed zucchini. We tend to go Paleo, which this recipe is (mostly). Quinoa is somewhat transitional in that it is a grain, but it IS gluten free, so we'll call that a win! So glad you like the recipe! I wonder if it would work to swap out the quinoa for something like "cauliflower rice" to make it 100% Paleo? Might be worth a try.